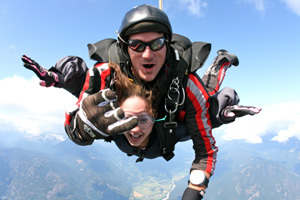 Now you can experience the ULTIMATE thrill with Whistler Skydiving! Flying high above the Pemberton Valley with views of Whistler, Blackcomb and Mt. Currie, strap yourself in for a sport with a serious adrenaline factor! Complete the experience with a professional personalized video of your adventure! What better way to relive the experience than by adding one of our video or photo packages. Capture your entire skydive and parachute ride on USB drive and share your professionally edited video or photos with family and friends. You can pre-purchase the video or photos during booking, or, if you are unsure, just add on the service at the time of your jump! Just a short journey from Vancouver is WHISTLER SKYDIVING! We're only 25 minutes drive north of Whistler or 2 hours north of Vancouver; you could be flying high above the Pemberton Valley with views of Whistler, Blackcomb and Mt. Currie. We're located at the Pemberton airport at 1850 Airport Road in Pemberton, BC. Look for the Whistler Skydiving sign on the green house. © Whistler Skydiving Inc. All rights reserved.